This conference on ‘Formulas in the Literature, Civilisation and Language of Medieval England’ began with the observation that formulas are omnipresent in medieval England. Medieval literature is based, in large part, on the use of formulaic elements, hence the debate regarding the oral or written composition of texts. 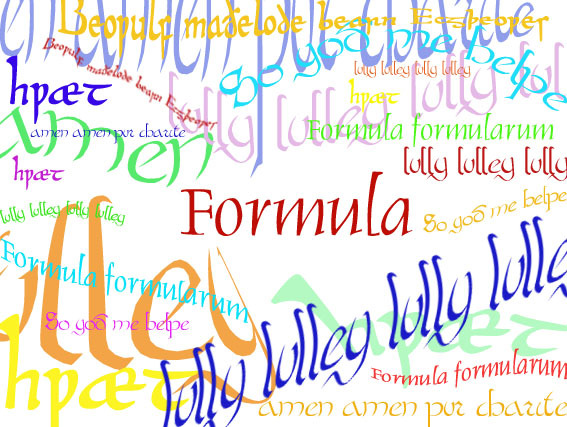 The notion of formulas is also important in linguistics, with the idea of clichés and, more generally, with the opposition between fixed and mutable elements in language. It can also be applied to civilisational studies in a society where the collective dimension is dominant and life is given a rhythm by its numerous rituals. To speak of ‘formulas’ is to make reference to types of writing and storytelling based on the reuse of recognisable and familiar stylistic and generic figures. The notion of ‘formulas’ involves the ideas of repetition and variation. It thus indirectly poses the larger question of the relation between the individual and society. This conference grew out of the work on Medieval England conducted by the GRENDEL research group at Nancy 2 (Medieval Studies), of which it marked the tenth anniversary. By reflecting on a major research subject for medieval studies – that of formulas – the medievalists at Nancy 2 sought to expand their dialogue with scholars in France and abroad and to undertake the study of a question that lends itself to interdisciplinary approaches. The conference brought together sixteen scholars, from several major French universities as well as from Russia, Canada, Spain and Poland. The reflection on formulas began during the two days of that conference was continued and enlarged with the organisation of a second international conference on Formulas in the Middle Ages, held in November 2010. Proceedings of the conference have now been published by the Presses Universitaires de Nancy, La formule dans la littérature et la civilisation de l’Angleterre médiévale, édité par Colette Stévanovitch, Elise Louviot, Dominique Hascoët et Philippe Mahoux (2011).